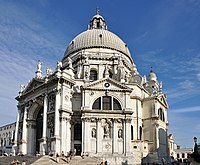 The Baroque (UK: /bəˈrɒk/, US: /bəˈroʊk/) is a highly ornate and often extravagant style of architecture, music, painting, sculpture and other arts that flourished in Europe from the early 17th until the mid-18th century. 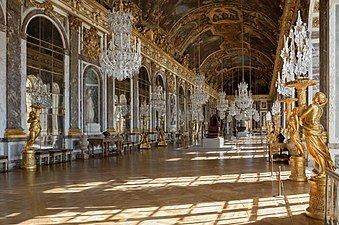 It followed the Renaissance style and preceded the Rococo (in the past often referred to as "late Baroque") and Neoclassical styles. 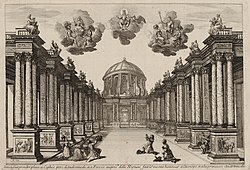 It was encouraged by the Catholic Church as a means to counter the simplicity and austerity of Protestant architecture, art and music, though Lutheran Baroque art developed in parts of Europe as well. The Baroque style used contrast, movement, exuberant detail, deep colour, grandeur and surprise to achieve a sense of awe. 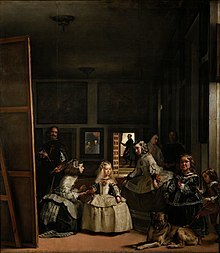 The style began at the start of the 17th century in Rome, then spread rapidly to France, northern Italy, Spain and Portugal, then to Austria and southern Germany. By the 1730s, it had evolved into an even more flamboyant style, called rocaille or Rococo, which appeared in France and central Europe until the mid to late 18th century.